This article is about archaeological remains, known in Spanish and Portuguese as "conchales". For the municipality in São Paulo, Brazil, see Conchal. For the study of modern refuse and trash, see Garbology. A midden (also kitchen midden or shell heap; from early Scandinavian; Danish: mødding, Swedish regional: mödding) is an old dump for domestic waste which may consist of animal bone, human excrement, botanical material, vermin shells, sherds, lithics (especially debitage), and other artifacts and ecofacts associated with past human occupation. The word is of Scandinavian via Middle English derivation, and is today used by archaeologists worldwide to describe any kind of feature containing waste products relating to day-to-day human life. They may be convenient, single-use pits created by nomadic groups or long-term, designated dumps used by sedentary communities that accumulate over several generations. Edward Sylvester Morse conducted one of the first achaeological excavations of shellmounds in Omori, Japan in 1877, which led to the discovery of a style of pottery described as "cord-marked", translated as "Jōmon", which came to be used to refer to the early period of Japanese history when this style of pottery was produced. Shell middens were studied in Denmark in the latter half of the 19th century. The Danish word køkkenmødding (kitchen mound) is now used internationally. The English word "midden" (waste mound) derives from the same Old Norse word that produced the modern Danish one. 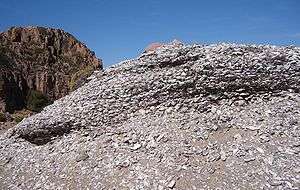 The Turtle Mound shell midden is the largest on the US East Coast. Shell middens are found in coastal zones all over the world. Consisting mostly of mollusc shells, they are interpreted as being the waste products of meals eaten by nomadic groups or hunting parties. Some are small examples relating to meals had by a handful of individuals, others are many metres in length and width and represent centuries of shell deposition. In Brazil, they are known as sambaquis, having been created over a long period between the 6th millennium BC and the beginning of European colonisation. Shell middens created in coastal regions of Australia by indigenous Australians exist in Australia today. Aboriginal Australians were nomadic hunter-gatherers who built no permanent structures. Middens provide evidence of prior occupation and are generally protected from mining and other developments. One must exercise caution in deciding whether one is examining a midden or a beach mound. There are good examples on the Freycinet Peninsula in Tasmania where wave action currently is combining charcoal from forest fire debris with a mix of shells into masses that storms deposit above high-water mark. Shell mounds near Weipa in far north Queensland that are mostly less than 2 meters high (although ranging up to 10 meters high) and a few tens of meters long are claimed to be middens, but are in fact shell cheniers (beach ridges) re-worked by nest mound-building birds. 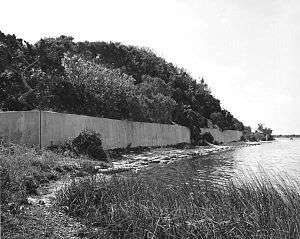 Shell mounds are also attributed to the creation of tropical hardwood hammocks, one example being the Otter mound preserve in Florida, where shell deposits from Calusa natives provided flood free high areas in otherwise large watered areas. The word "midden" is still in everyday use in Scotland and Northern England, and has come by extension to refer to anything that is a mess, including people. This use was also taken to Northern Ireland by Scottish plantation settlers. In West Yorkshire, a midden is an outside lavatory, typically in the back yards of terraced houses. Often attached to this small building is an outhouse which houses dustbins. Some birds and animals, including some species of fishes, collect foodstuffs with heavy shells that are hard to remove. They may establish sites where rocks or similar items are available as natural anvils on which the animals habitually break open the shells. These discarded shells may accumulate around the anvils in sizable middens, sometimes for generations. Commonly such middens are sited where there is a convenient rock that is an unusual resource in the region. ↑ Oxford English Dictionary (3rd ed. ), 2003 . ↑ Brinton, DG (1866). "Artificial Shell-deposits of the United States". Reports. Washington: Smithsonian Institution. ↑ Stein, Julie (2000). Exploring Coast Salish Prehistory: The Archaeology of San Juan Island. ↑ "Whaleback Shell Midden". Whaleback Shell Midden. Retrieved 2006-05-11. ↑ John Whitney Hall (1988). The Cambridge History of Japan. Cambridge University Press. p. 59. ISBN 978-0-521-22352-2. ↑ Stein, Julie (1992). Deciphering a Shell Midden. Academic Press. ISBN 0-12-664730-5. ↑ "Marine Geology : Shell mound formation in coastal northern Australia:". ScienceDirect. 1995-12-31. Retrieved 2014-02-24. ↑ "Otter Mound Preserve". Colliergov.net. Retrieved 2014-02-24. ↑ Pluckhahn, Thomas J.; Thompson, Victor D.; Cherkinsky, Alexander (2015). "The temporality of shell-bearing landscapes at Crystal River, Florida". Journal of Anthropological Anthropology. 37: 19–36. ↑ "Roofed Midden benefits Lake District Farm". Thanks to a grant from Farming Connect Cumbria the Booths were able to roof the slurry midden, probably trebling its capacity by excluding the rainwater, as well as making necessary repairs to the midden itself to prevent possible run-off to a nearby beck. The midden can now provide up to 10 weeks' storage for the slurry. ↑ dfg.webmaster@alaska.gov. "Alaska Department of Fish & Game: North American Red Squirrel". Adfg.state.ak.us. Retrieved 2014-02-24. ↑ Chase, B.M. ; Meadows, M.E. ; Scott, L.; Thomas, D.S.G. ; Marais, E.; Sealy, J.; Reimer, P.J. (2009). "A record of rapid Holocene climate change preserved in hyrax middens from southwestern Africa". Geology. 37 (8): 703–6. Bibcode:2009Geo....37..703C. doi:10.1130/G30053A.1.